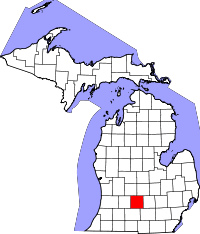 Eaton County is a county in the U.S. state of Michigan. As of the 2010 census, the population was 107,759. The county seat is Charlotte. Eaton County was named for John Eaton, who was Secretary of War under U.S. President Andrew Jackson, making it one of Michigan's Cabinet counties. It was organized in 1837. According to the 2000 census, the county has a total area of 579.02 square miles (1,499.7 km2), of which 576.41 square miles (1,492.9 km2) (or 99.55%) is land and 2.61 square miles (6.8 km2) (or 0.45%) is water. I-69 Business Loop a route traveling through downtown Charlotte. I-69 Business Loop a route traveling through Lansing and East Lansing. Fitch H. Beach Airport is a general aviation airport in Charlotte. Capital Region International Airport, at the northeast corner of Eaton County, offers scheduled passenger flights. Eaton County was formed in 1837 from open territory. It was named after John H. Eaton, an American Secretary of War. The county is one of the so-called Cabinet counties because it was named after a member of the cabinet of US President Andrew Jackson. As of the census of 2000, there were 103,655 people, 40,167 households, and 28,237 families residing in the county. The population density was 180 people per square mile (69/km²). There were 42,118 housing units at an average density of 73 per square mile (28/km²). The racial makeup of the county was 90.25% White, 5.29% Black or African American, 0.44% Native American, 1.13% Asian, 0.03% Pacific Islander, 1.17% from other races, and 1.70% from two or more races. 3.21% of the population were Hispanic or Latino of any race. 24.1% were of German, 13.0% English, 11.2% American and 8.7% Irish ancestry according to Census 2000. 95.6% spoke English and 2.0% Spanish as their first language. There were 40,167 households out of which 33.80% had children under the age of 18 living with them, 56.30% were married couples living together, 10.30% had a female householder with no husband present, and 29.70% were non-families. 24.50% of all households were made up of individuals and 8.40% had someone living alone who was 65 years of age or older. The average household size was 2.54 and the average family size was 3.03. In the county the population was spread out with 26.10% under the age of 18, 9.10% from 18 to 24, 28.80% from 25 to 44, 24.60% from 45 to 64, and 11.30% who were 65 years of age or older. The median age was 36 years. For every 100 females there were 94.60 males. For every 100 females age 18 and over, there were 91.50 males. The median income for a household in the county was $49,588, and the median income for a family was $57,898. Males had a median income of $41,978 versus $29,638 for females. The per capita income for the county was $22,411. About 4.10% of families and 5.80% of the population were below the poverty line, including 6.80% of those under age 18 and 5.90% of those age 65 or over. County Treasurer: Bill Conarton, Jr. This page uses content from the English language Wikipedia. The original content was at Eaton County, Michigan. The list of authors can be seen in the page history. As with this Familypedia wiki, the content of Wikipedia is available under the Creative Commons License.